Dental implants are substitute tooth roots that are placed into the jawbone by Dr. Wilson, a specialist of the gums and supporting bones. Dental implants provide a strong foundation for replacement teeth that look, feel, and function like natural teeth. There are many treatment options for dental implants, from replacement of a single tooth or a failing bridge to restore a natural smile, to providing a stable foundation to attach partial and full dentures. Implant treatment allows people who have lost teeth to regain the ability to eat virtually anything and to smile with ease and confidence in the knowledge that their appearance is natural once again. Dental implants are a great way to replace missing teeth or provide a more stable solution than having removable partial or complete dentures. Implants provide excellent support and stability for these dental appliances. A November 2009 article in the Health section of the New York Times touts the benefits of dental implants versus a bridge. The loss of a tooth is a traumatic event. The psychological trauma is greatly multiplied when the tooth is part of a patient's smile. Dr. Wilson understands the emotional stress caused by the loss of a tooth. For that reason, he and his staff make it a priority to ensure patients understand their options regarding tooth replacement following extractions. Tooth replacements, usually removable, can always be prefabricated by a patient's dentist or Dr. Wilson. In highly specific cases, Dr. Wilson and his staff can place a temporary crown on an implant placed on the day of the tooth extraction. The crown is meant to be a cosmetic tooth replacement during the initial healing of the extraction socket and while the bone bonds to the implant. Psychologically, the impact of having an immediate tooth replacement greatly reduces the emotional trauma of losing the tooth. 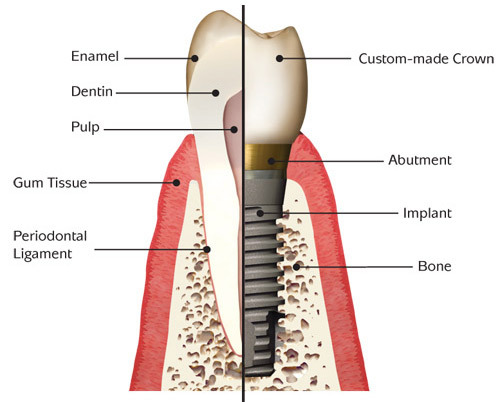 After the implant has bonded to the bone, a connection post (abutment) will be placed so that your dentist can fabricate your new replacement tooth. There are different types of abutments, including abutments prefabricated by the implant company or customized abutments fabricated for your particular anatomy. Customized abutments are more commonly utilized for the anterior cases where esthetic considerations are important. Your dentist and Dr. Wilson will recommend the appropriate abutment for your situation. In most cases, once the abutments are attached, impressions are taken of your teeth, implants, and abutments, so that your replacement teeth can be fabricated from an exact replica of your mouth. In some cases, impressions will be taken of the implant so that the laboratory can select or fabricate an appropriate abutment. In these cases the final abutment and final tooth replacement are inserted on the same day. Implant maintenance care is very similar to the care necessary for your natural teeth. Good oral hygiene, eating habits, and regular dental visits will aid in the life of your new implant.